Homemade peanut butter cups are super easy to throw together and perfect for days when you're craving something sweet but have an empty baking cupboard. These can be made with just three ingredients and 15 minutes. Clear space in your freezer for a muffin tin. Line tin with 6 liners (12 if making minis). Place 3 small microwave-safe bowls on the counter. To the first, add 1/3 cup chocolate chips and 1 teaspoon coconut oil. To the second, add 1/3 heaping cup of chocolate chips and 1 1/4 teaspoon coconut oil. To the third, 3 tablespoons of peanut butter. Melt the chocolate in the first bowl by microwaving for 30 seconds. Stir and microwave for an additional 15 seconds if necessary, until you are able to stir the chocolate smooth. Add 1 heaping teaspoon of chocolate to each prepared muffin cup, smoothing the chocolate out into an even layer so it covers the entire bottom. If there is any chocolate left in the bowl, divide it evenly(ish) between the cups. Place in the freezer for 5 minutes or until chocolate is hardened. Place the bowl with peanut butter in the microwave and heat for 20 seconds. Stir and heat for an additional 10 seconds if the peanut butter is not smooth and pourable. Stir in powdered sugar and drop a teaspoon of peanut butter onto the center of each muffin cup. The peanut butter should spread to almost the edges but not touch. If there is any leftover peanut butter, divide it between the cups. Freeze for 5 minutes. Repeat step 3 with remaining bowl of chocolate. Freeze for at least 10 minutes. Enjoy! 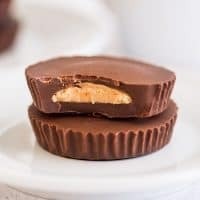 If making mini peanut butter cups, use 1/2 heaping teaspoon chocolate and 1/2 teaspoon peanut butter mixture for each layer. Store peanut butter cups in their wrappers in an airtight container in the refrigerator or freezer.